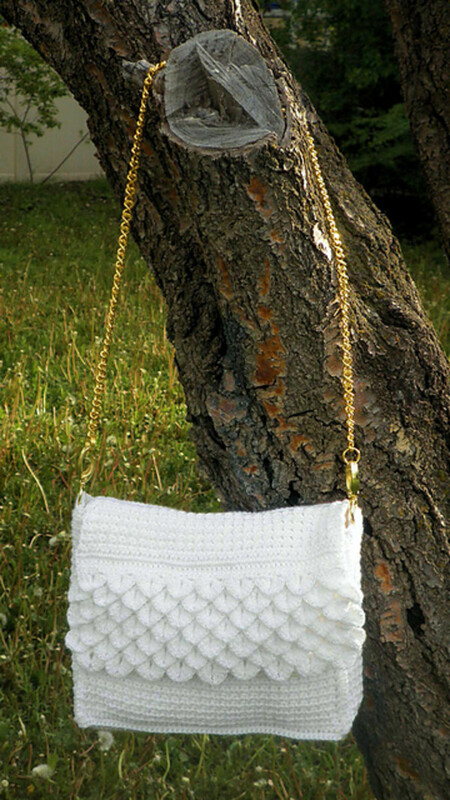 The crocodile crochet stitch portrays crocodile scales in a romantic manner, so different from the tough exterior of the mighty crocodile. This crochet stitch pattern produces a thick, warm cloth perfect for scarves, shawls, wrist-warmers, etc. 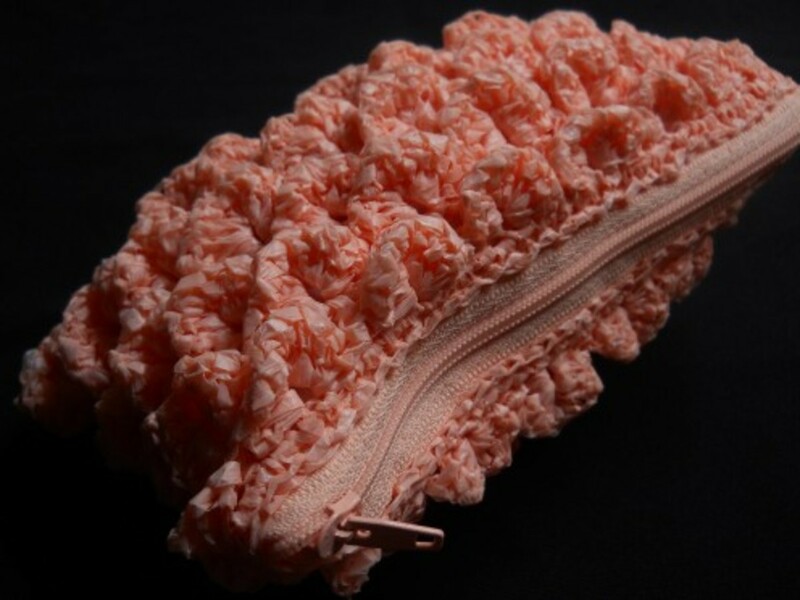 Its three-dimensional effect produces a beautiful accent on bags, hats, and cowls. 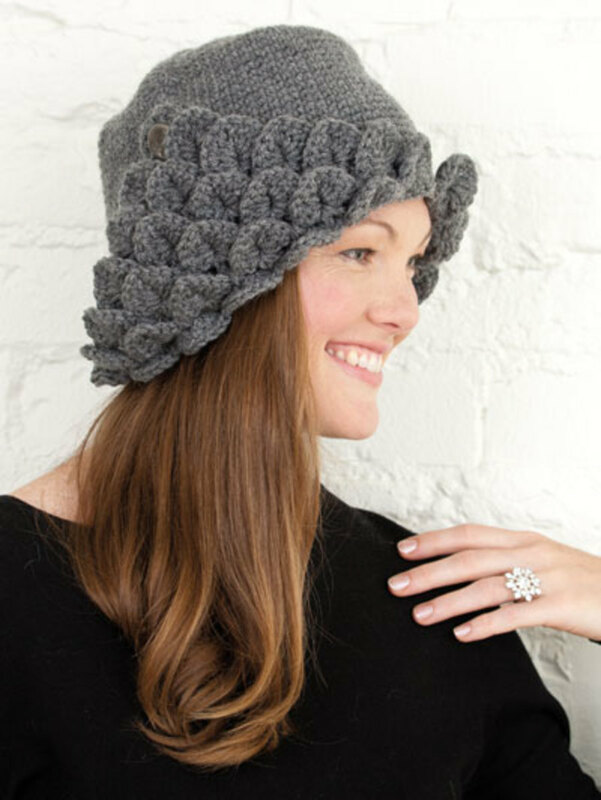 Even when used throughout, any FO becomes an elegant piece. 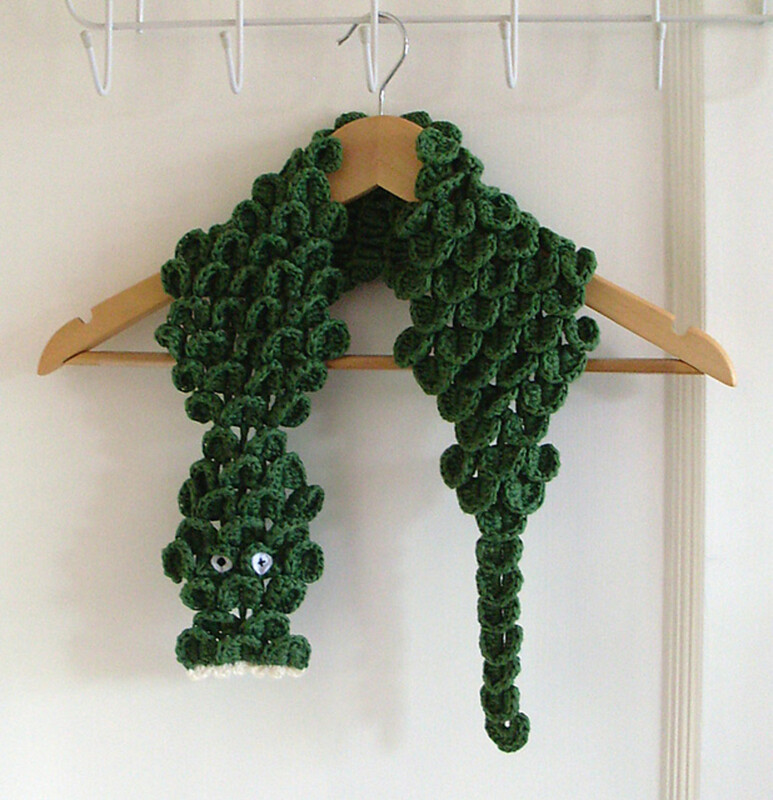 I first saw the crocodile stitch in a scarf pattern on Ravelry. 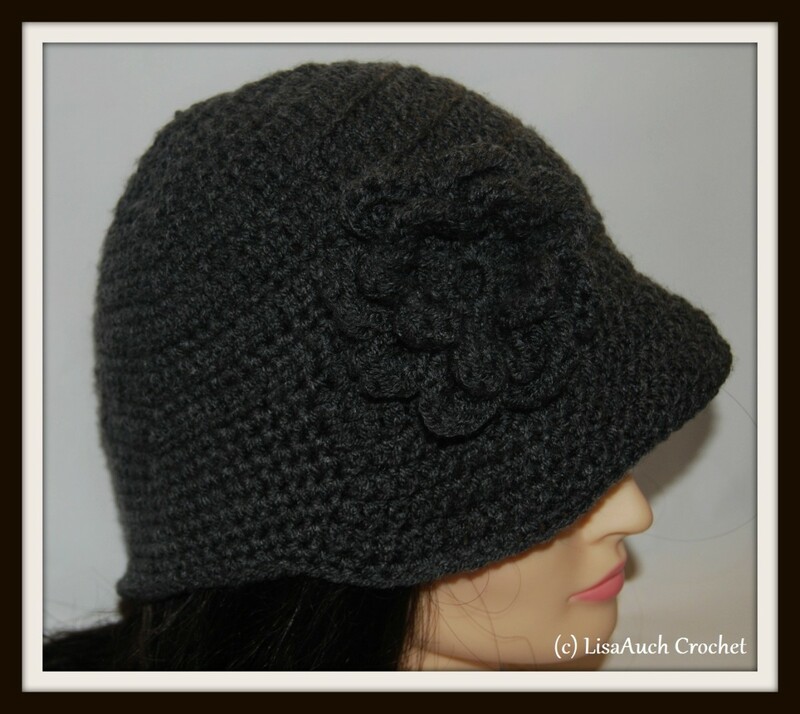 A few days later, I saw of video link posted on Crochet Pattern Central. So I got curious and searched Google, Ravelry, and Etsy for more FO’s and patterns. I also searched YouTube for more videos. I found few free written patterns that are quite difficult to understand (or I just didn’t have the patience to read it thoroughly). Most of the videos are too long as well, my attention just can’t last for a 30+-min or 13+-min video. There’s a 5-min video (floating right) but it only shows two rows, not the 4-row repeat that shows how to create the staggered arrangement of the crocodile stitch. Because of all these, it seemed to me that the crocodile stitch is some sort of classified information. After watching the video by CrochetGeek a.k.a. Art of Crochet by Teresa, I decided to do it. The instructions are still vague, especially the beginning and end row. However, I already understood the idea how to form each “scale”. I tried it on a Saturday night with a 20-in foundation chain. The problem on beginning and ending a row still persists. So I just went to sleep at 11 pm but whenever I wake up, the stitch pattern simulates in my head. I couldn’t sleep no more. At 5:00 in the morning I woke up, returned to my failed project and worked on it. SUCCESS! The following Sunday, I felt the need to create an FO using the crocodile stitch and thought a very small purse would be a perfect start. I was having a debate in my mind whether to make a crochet cloth, fold, and stitch to the purse or just work on both sides of the chain and work in rounds. After much mental deliberation, I decided to choose the latter. At first, I turned at the end of each round but soon realized it’s easier to work without turning. There’s a slight advantage, though – the beginning of odd round moves slowly from the side towards the center because of the staggered arrangement of the crocodile scales. Nevertheless the advantage outweighs the disadvantage – I didn’t have to worry how to end and begin the row making it easier to follow the staggered arrangement. Figure 2: The stitches in the odd rows of the crocodile stitch pattern. Figure 3: The odd row stitches are drawn in black, the even row stitches are drawn in blue. 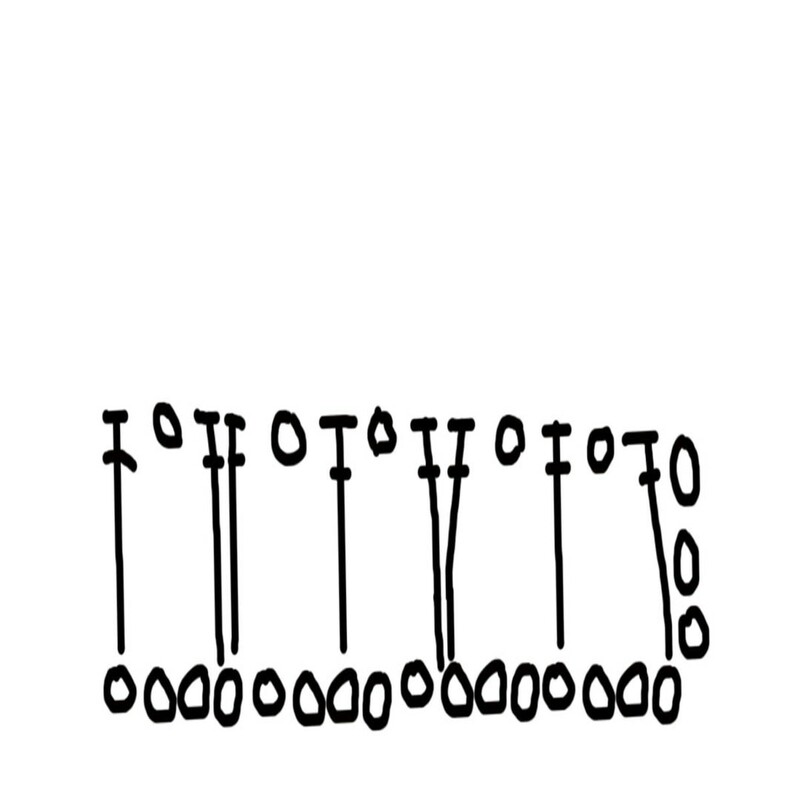 This shows the arrangement of stitches to make one "scale"
Figure 4: This figure shows the direction of working the even-row dc's on the post of the odd-row twin dc's. There are many variations to this stitch pattern. My version is based on the video by CrochetGeek. Honestly, it was too long I didn’t watch it closely. But I like it because it has subtitles, which means I can watch it silently. I can’t say for certain that this pattern is the same as that of the video but it is very similar. Most videos I’ve watched do not define a formula for the foundation chain – I did. To clearly understand this stitch, one must have a clear concept of the parts of dc stitch (see Figure 1). Normally, new stitches are worked on top of old stitches. 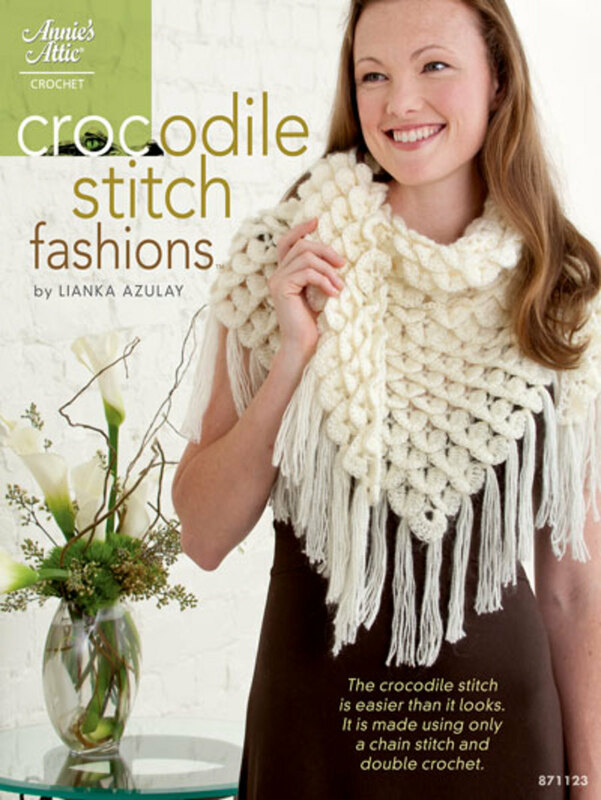 That is not the case for the crocodile stitch. The stitches of the even rows are worked on the posts of the dc’s in odd rows, hiding these rows in the process (see figure 3). When making a crochet cloth, the crocodile stitch requires the repetition of 4 rows worked back and forth. 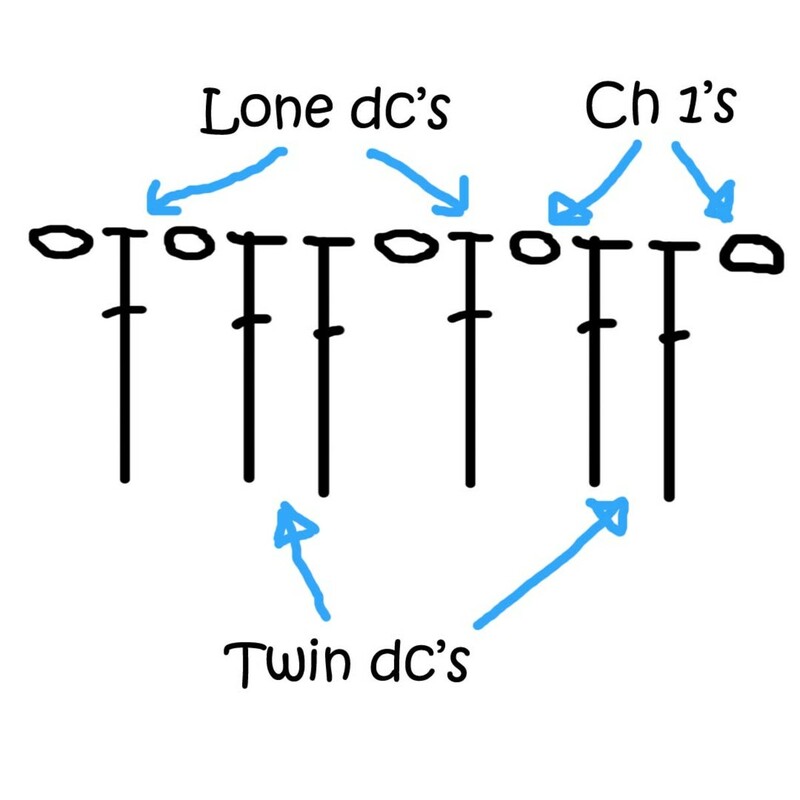 The odd rows (row1, 3, 5…) contain alternate lone and twin dc’s separated by ch-1’s (see Figure 2). These rows are invisible from the right side and only serve as anchors of the “scales”, which are worked on the even rows (row 2, 4, 6…). On the even rows, 10 dc’s worked on the twin dc’s of odd rows, 5 dc’s for each dc, which are anchored along the posts of the twin dc’s (see Figure 3). The first 5 dc’s are worked from top to base of the first dc, the last 5 dc’s are worked from base to top of the next dc (see Figure 4). 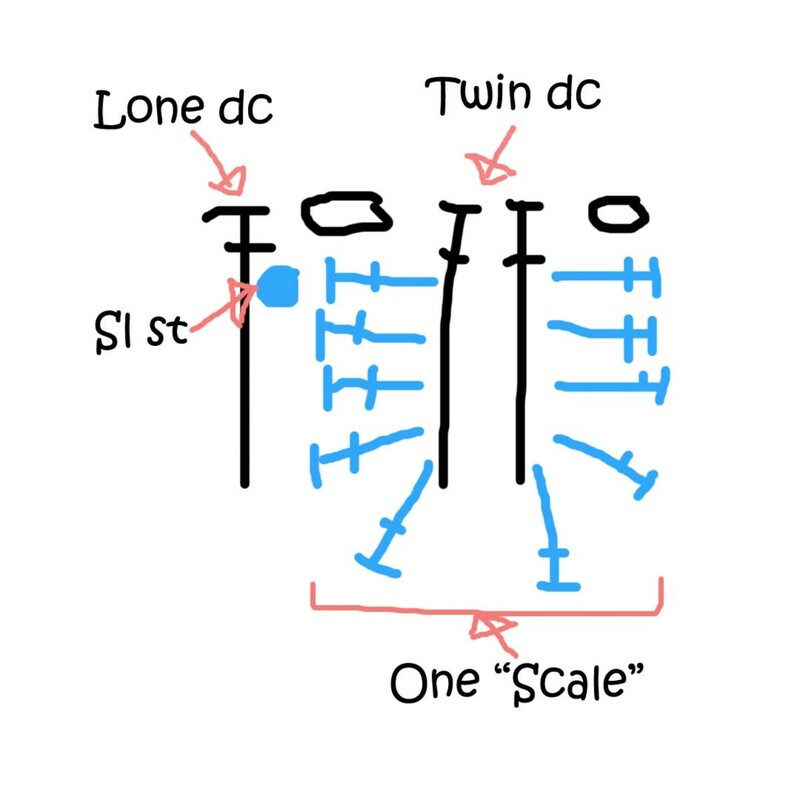 The last of the 10 dc’s that forms the “scale” is secured with a sl st on the post of the next lone dc (see Figure 3). 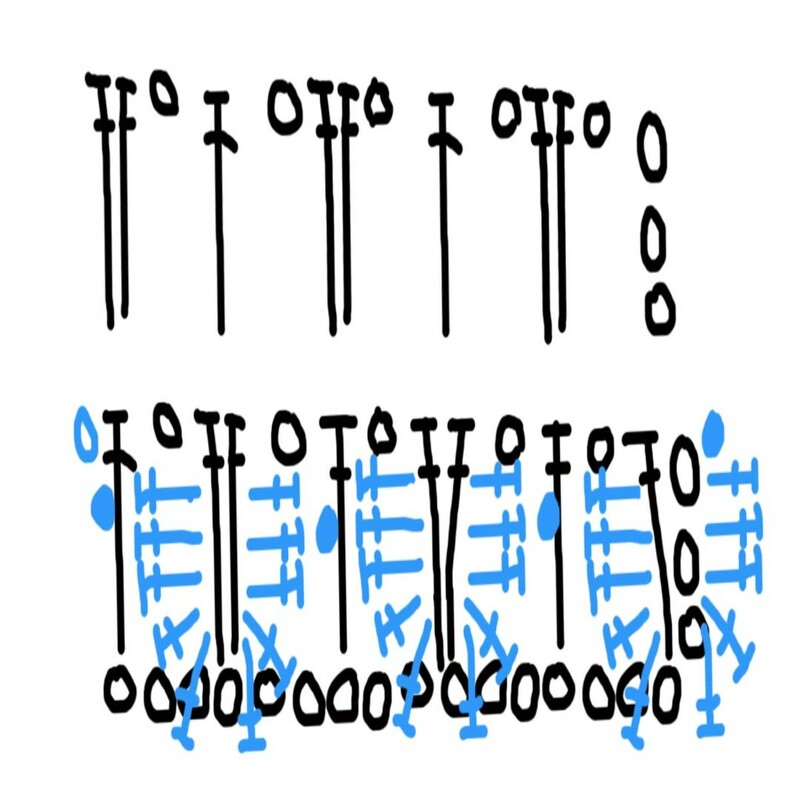 Here is a chart of the crocodile stitch pattern. 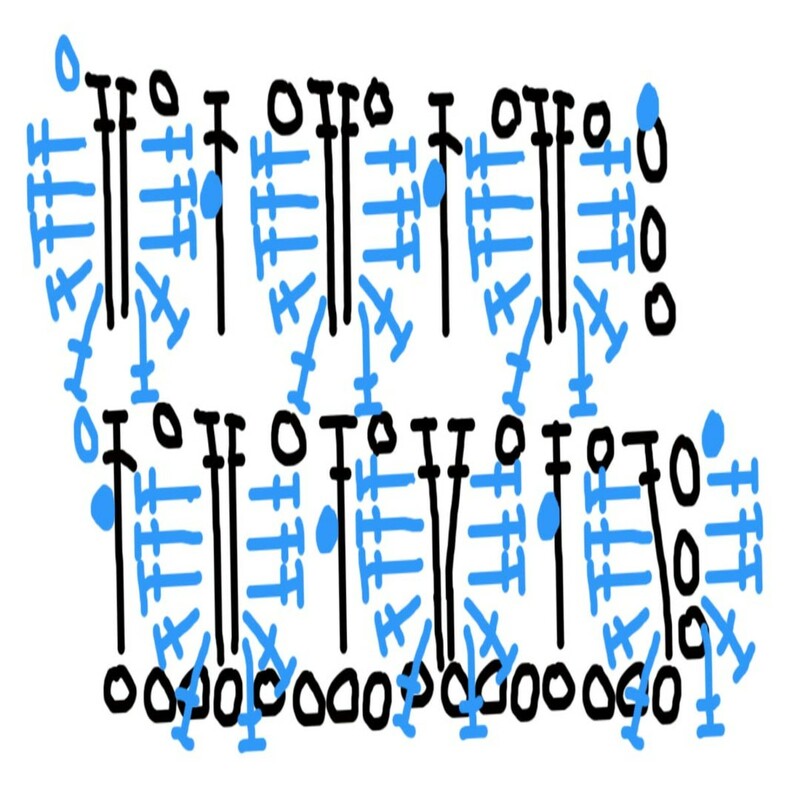 The odd rows are drawn in black, the even rows are drawn in blue. Figure 5: The crocodile crochet stitch pattern - black symbols represents odd rows while blue represents even rows. Foundation Chain: Ch a multiple of 6+4. 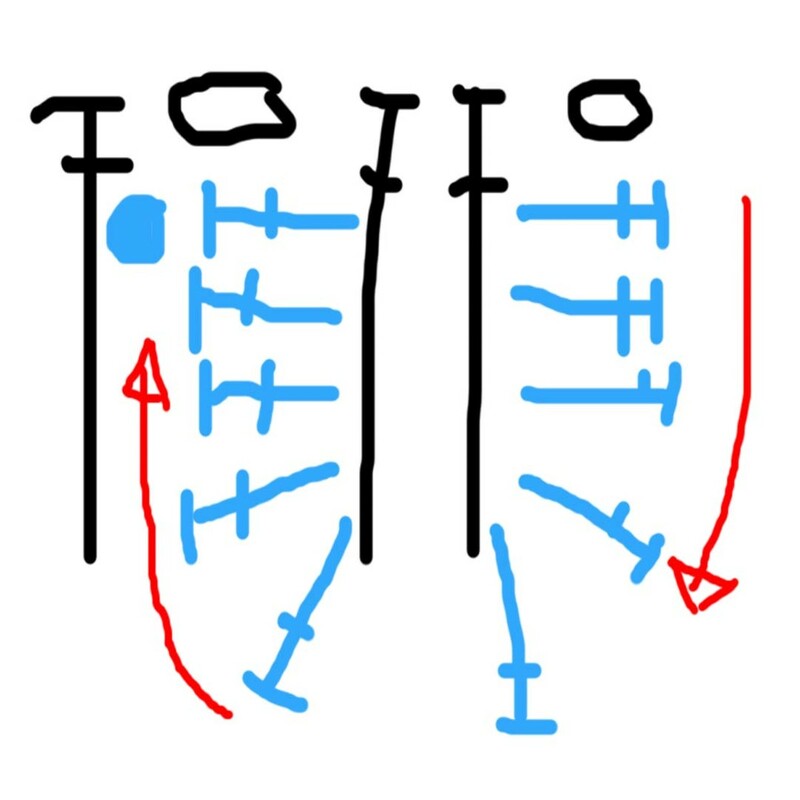 Since Row 1 is anchored on the foundation chain, just anchor the stitches similar to how row 3 is worked. After reading this article, do you plan to use the crocodile stitch in your future crochet projects? Definitely! Thanks for making it clear. No, I still don't understand it. I've used it before, I'm living a link to my FO in the comments. 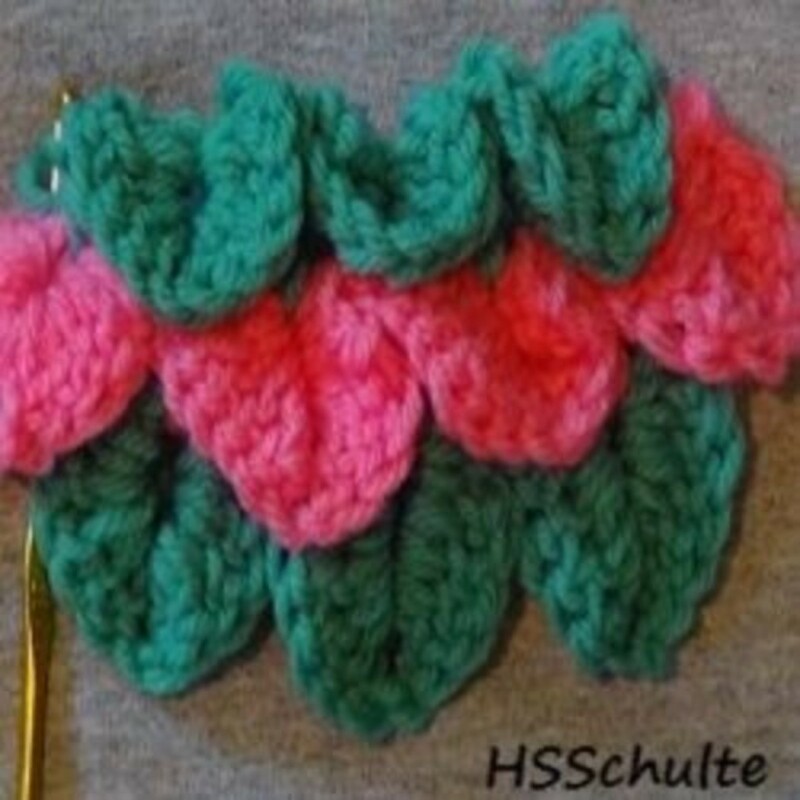 I hope this article will encourage you to try this stitch pattern in your next crochet project. 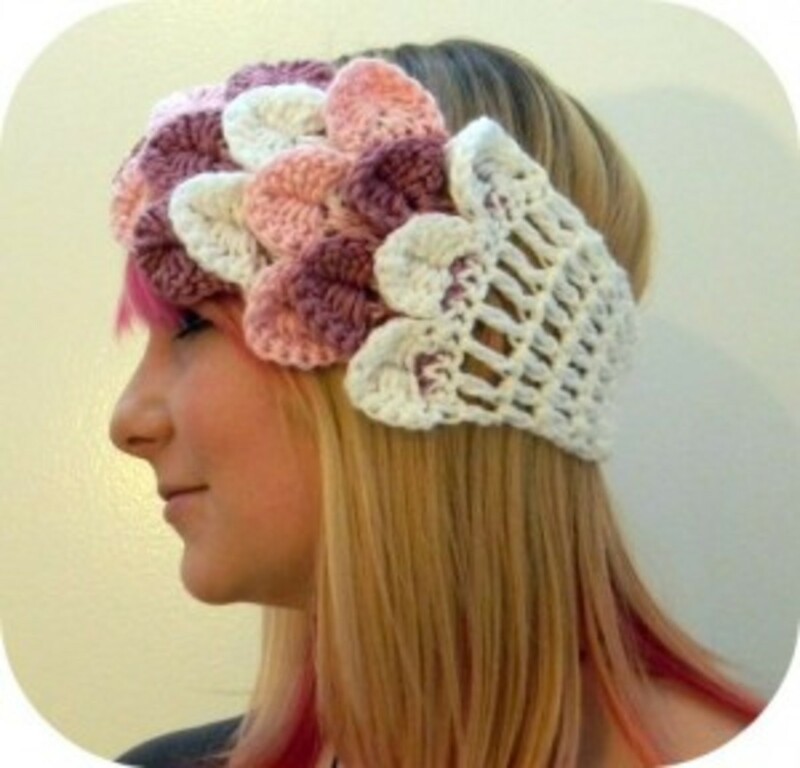 I love crochet but I've never tried this stich. I think I must give it a try. 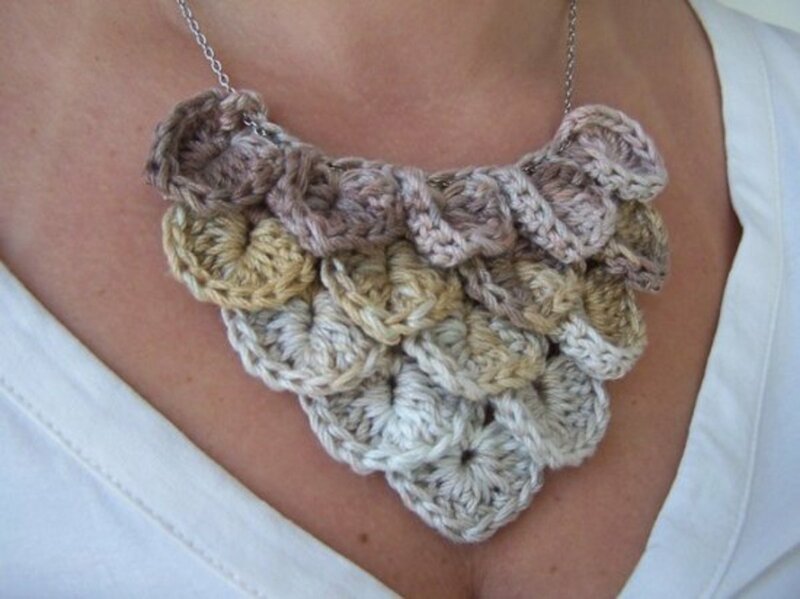 Love this crotchet stitch. I have made two cushion covers with this pattern. You dont have to crochet a foundation row after each scale row. 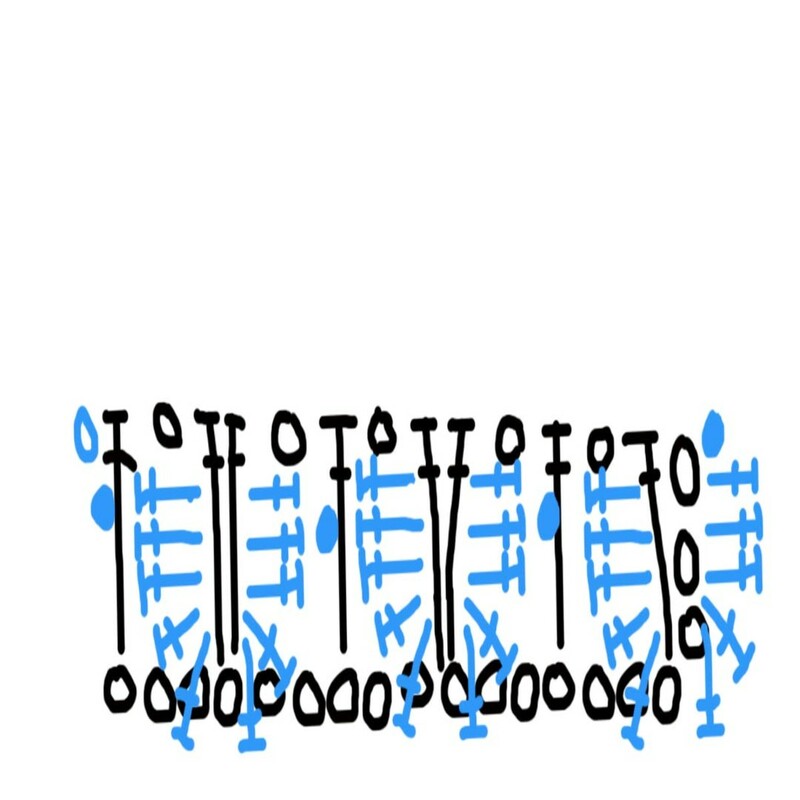 There is a diagram on the 'Written Pattern' section that shows how to do he sticth row by row. Just click on the thumbnail to view the full size of the diagram. Love this stitch. Would someone be good enough to answer a question for me?????? 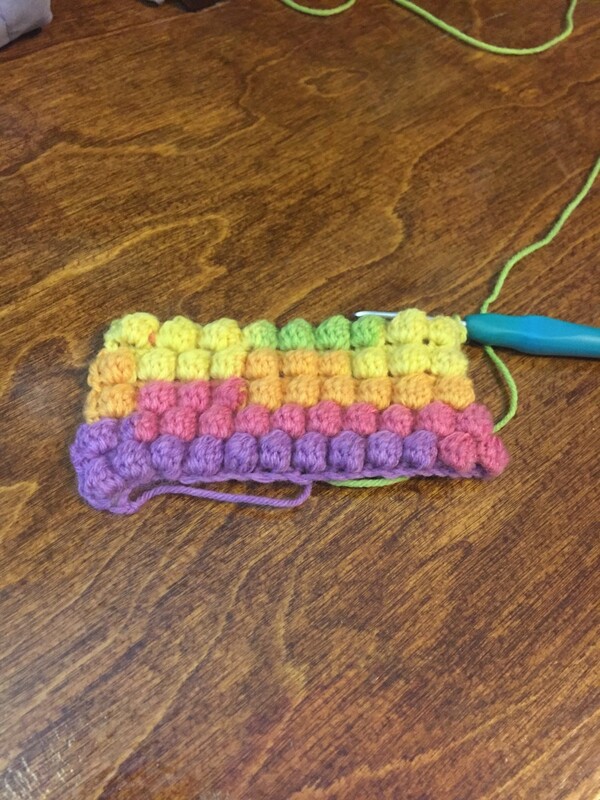 Do I have to crochet a foundation row after each scale row? Thank you, VVanNess! I love this stitch so much! This is just beautiful! I bet it keeps your ears warm too! Nice job! Hello RhondaHumphreys1! The hood is from DaintyLoops.com but unfortunately the link is no longer there. I'm not sure what happened. I love Bonita Patterns too especially the booties. Thanks for leaving a comment. Thank you so much for the great hub. I too love the patterns from Bonita patterns. They are beautiful. You have a hood in one of your pictures do you know where it is from? I'd love to make it. Thank you Anamika. I'm not very patient too so I keep my projects small. 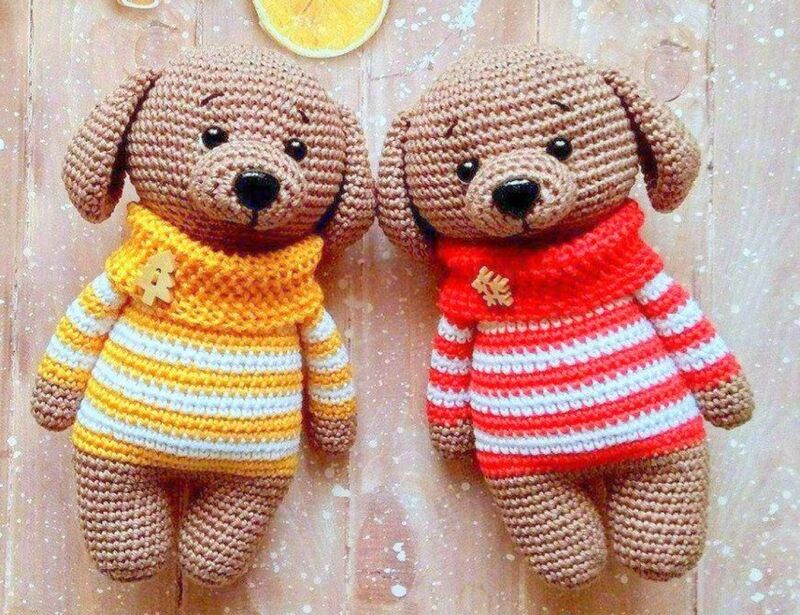 ",) I hope you give crochet a try someday. Hello Daughter of Maat! I'm happy to help you fulfill your crocodile baby booties! Interesting! I really appreciate people with your skills. Though I love stuff like these, I don't have the patience to learn or do it. This is a great hub. The crocodile stitch can be really confusing when you're reading the pattern. These are very helpful tips! 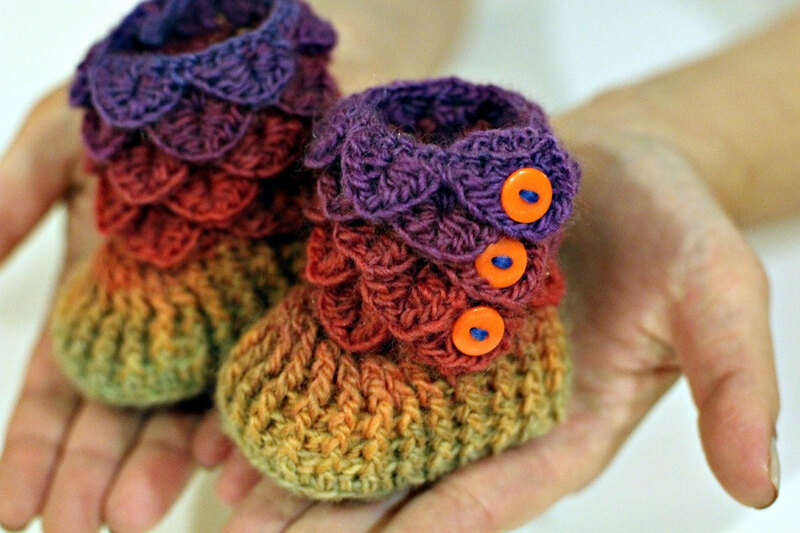 Now I can actually try making the crocodile baby booties without feeling intimidated!! I've been wanting to try this for a while now, thanks for making the instructions a lot clearer than any I have found so far. It's quite a work out for your hands lol. Of course I tried it with #10 crochet cotton and a size #7 hook, probably not the best tools for trying a new stitch but its what I work with and all I had. Still came out cute tho, like a mini version of the yarn one. I respect if you feel that way Lucia. I love the designs of Bonita patterns, too. That's why I featured her baby booties with a link to her site. What I'm trying to do here is just to explain the stitch. What others will do with the stitch is their concern. And I hope you respect that, too. I really do not understand anything that you are making, it is a very cheap copy of the bonita patterns has been developing . Even, you are showing the baby boots that became a best seller. I love ! It's very interesting. I would like to find books with différent models to realize but in France it's difficult. More thanks you are too strong. Excuse my english (i dont practise). I got lost watching the videos, too. Hope it turns out great, holyjeans. I'm bookmarking this to check out this weekend. I just recently saw about this stitch and tried to work it watching the video, and I got totally lost. Thank you for breaking it down a lot better, so I'll definitely be back to try it. Charts makes things simple for me, It's easier to explain things with a chart. It's a teacher thing. ",) Old habits die hard. @Priya: You should try this pattern of mine (moiracrochets.hubpages.com/hub/Crochet-Purse-Free-Pattern2) because it does not require attaching. As to the wooden handle, I haven't tried that so I would not have any idea. I'm sorry. I hope this helps. i tried the purse but was not able to attach the two parts of the purse since the scales are not evenly placed. can u help me? also tell me how to attach a wooden handle to the purse. Very nice post. Thanks for your consideration in making and sharing it with all. Hi Moira! I stumbled upon your great hub while lazily browsing and thinking about what to crochet next. I haven't tried the crocodile stitch yet so I'm thinking maybe I could make a tote bag. I admire your patience in making patterns. Although I have a few creations of my own, the thought of making patterns daunted me. Maybe you can give me a few hints? Thanks! It sure is interesting Serena. This stitch didn't let me sleep for a while. I miss teaching too. Now that I'm pregnant and hormones got me to dislike crochet, I'm starting to feel how mundane life is for a stay-at-home mom. My prayer now is for my creativity to come back because I sure lost it when I got pregnant. Boredom is killing me. :D thank you Moira! Tomorrow I will try this interesting stitch following your instructions! I read your profile: I'm a teacher too and I just had a baby :) I wish I could leave my work too and stay home with my little one now, but here in Italy we are facing a really hard time... so in a few months I will "go back to school" :( Since then, I will crochet and crochet and crochet!! ;) thank you again! Oh, I'm very sorry about the images not loading up. I'm happy you find the written instructions helpful. The tutorial is well done and I appreciate your efforts. I plan to use the Crocodile Scales as an edge on an afghan made with the Crazy Crochet stitch and wanted to see a symbol pattern for this stitch in order to get organized. I loaded this page twice and, both times, the thumbnail images for figures 6-9 loaded without the html link, so I could not view the full-sized images for those figures. Thank you for the written instructions. Yes LEE, it is a typo. Thanks for pointing that out (I'm editing it now) and for leaving a well-said comment. I'm glad you found this to be helpful. Thank you so much for this dissection. It condenses the information in those too long videos into an easy to understand form and makes this stitch all the more lovable. I do have a question though; in your written instructions for row one, you say ch 1, sk 2 ch, dc 1, sk 2 ch, 2 dc; but in the chart there's a ch 1 between the single dc and the double dc. I'm following the chart, as it makes more sense and follows the schematic for row 3, so was it just a typo? I felt the same way Sherry Ann, that's why I wrote this. I am happy that I am able to help you with something I wrote. For once someone really made the instructions clear. You are very talented & I appreciate that. Watched one video and did not really get the hang of it. Now I see where I went wrong. God Bless for doing this. 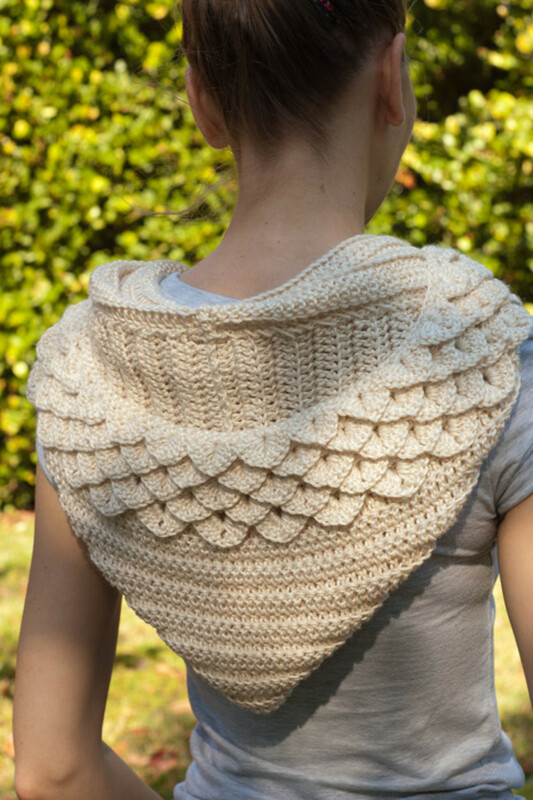 I just became VERY interested in the stitch pattern, and saw an opportunity for a great hub. And now, what a great hub it really is! It's actually my greatest. As for the colorful plastic bags, that's because I live in the Philippines where convenience is prioritized over "green-ness". 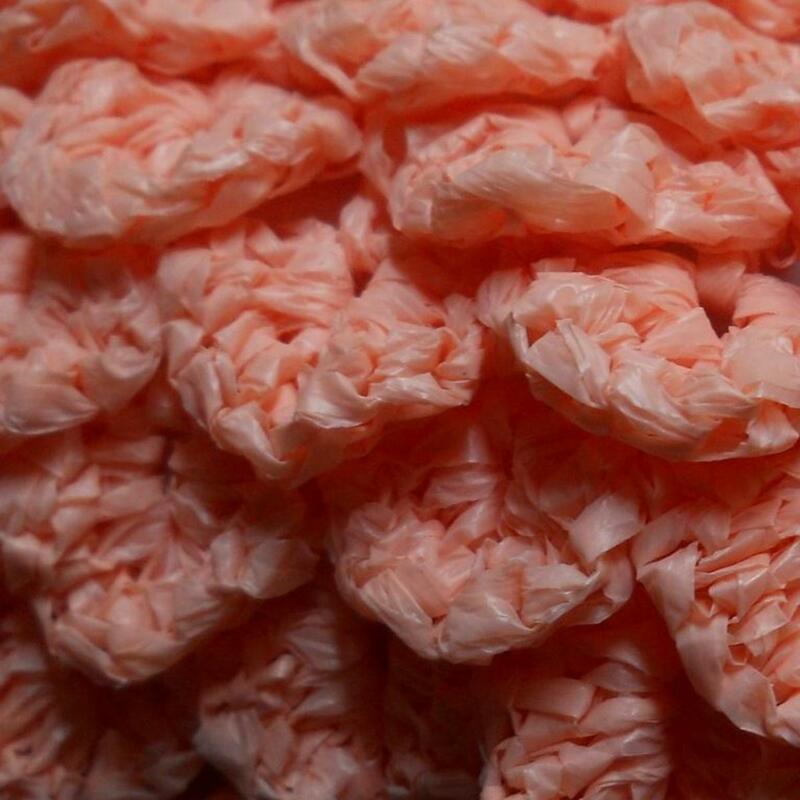 So, plastic bags abound in all thickness, texture and LOVELY colors. I don't even have to buy it. Most stores give them away for free. You skill in writing up charts is great. Here in the states we use written patterns so I'm not as used to them. 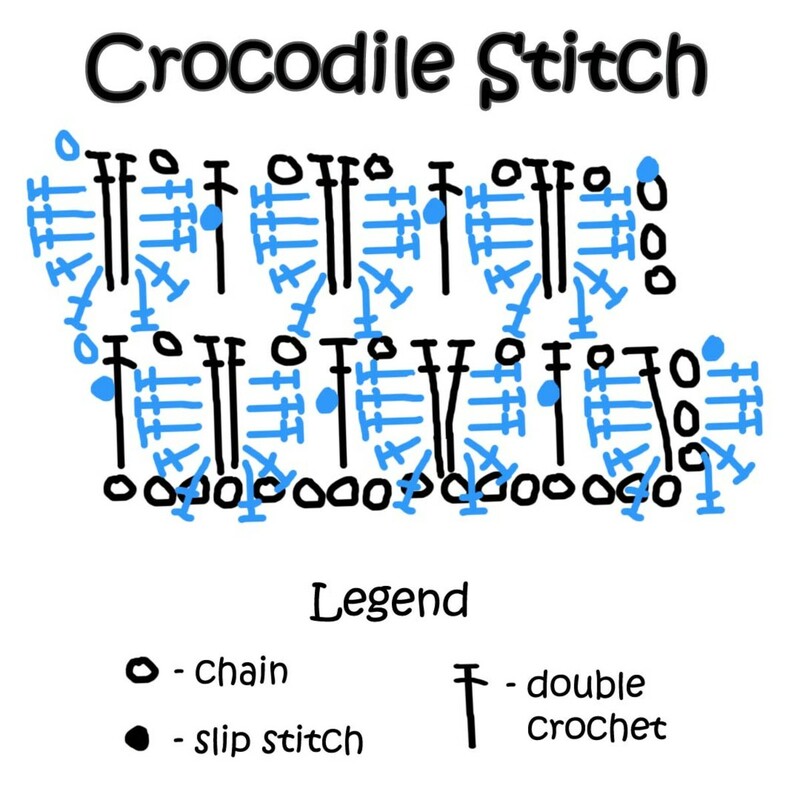 I like how you explained the crocodile stitch especially the title 'Crocodile Stitch Declassified'. Love the purse you made - how do you find all the different colors of plastic bags? Oh, thanks! I felt frustrated too when I first encountered this stitch. You are awesome for writing this out. It is really hard to find! Oh, the figures are thumbnails. You have to click the thumbnails to enlarge them. Above Figure 1, you see there are little pictures there. I'm so sorry about that. I just realized that it is not very noticeable. Thank you, sharon. Did I miss something? Your Figure 1 jumps to Figure 5. What happened to Figures 2,3,4 that are mentioned to SEE? You're very welcome Hezmyjoy! I do hope you will crochet again. I am so happy to be of help to you, Molly. It's great that you adjusted the pattern and even posted your adjustments here. I'll include it in the hub when I will find the time to edit this. I'm glad to have found such a comprehensive guide to this stitch. I tried it out today; I love it. I wanted the scales to look a little "pointier" so I used treble stitches for the two stitches at the top of the curve in the scale. Thank you POSHCOFFEECO. I was just lucky to find an interesting topic that was not yet well-written. Thank you Mimi, I spent a lot of time drawing that in Photoshop. That would be exciting! I can't think of ways to use this in jewelry, so I'm excited to see what you'll make. I'm sure I'll be experimenting with it, especially for makking jewelry like necklaces and earrings. Yes, it really is beautiful. I can't get it out of my head since I saw the second video. Great instructions, Moira! 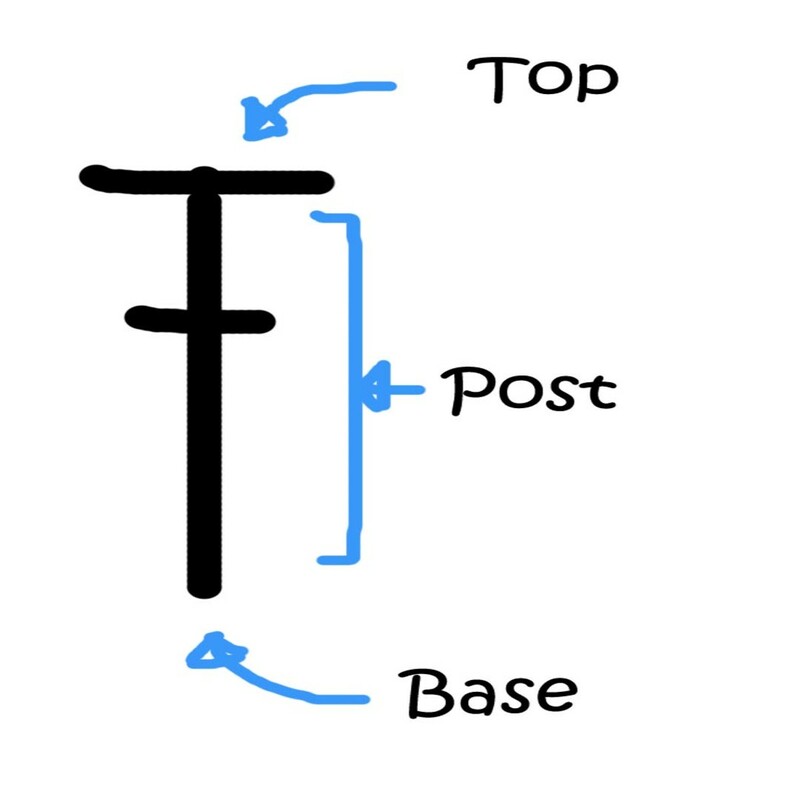 I love your symbol diagrams! This is the first time I've seen this stitch. The videos were helpful, too, especially the second one. Rated up and useful. I love the looks of this stitch. I'll have to try it. Thanks.